Oplev myter og herlighed i klassisk Grækenland på dette uforglemmelige 4-dages eventyr fra Athen. 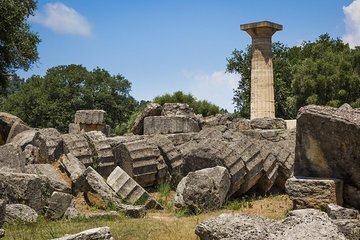 Besøg fem UNESCOs verdensarvsteder, herunder Old Olympia, Delphi, og klosteret Klostre Meteora. Gå blandt templerne til de græske guder, beundre udgravede statuer på arkæologiske museer og nyd nogle af de mest spektakulære landskaber i Grækenland. Turen inkluderer alle transportmidler, morgenmad og aftensmad hver dag, adgangsgebyrer og valg af 3- eller 4-stjernet overnatning. We had a fantastic time with Irene, our well-informed and gracious guide. The upgraded hotel accomodations were excellent, the food was good, and the itinerary was just what we wanted. We often tour on our own, but we thoroughly enjoyed relaxing on a coach bus and enjoying the scenery and a few naps between sights. I definitely recommend this tour. In 4 days we saw amazing sights. It was fast paced and also a very efficient use of the time. A traveler should be fit to hike. This would be very difficult for someone that is unsteady on their feet. The bus was comfortable, hotels very nice, food great and Anna our tour guide was amazing. I was traveling with my 16 yr old granddaughter and she loved it as much as I did. Like all trips, time is important. This tour is exceptional value for a truly priceless experience. A must for anyone visiting Greece. Had no idea how large Olympia was. Meteora was the star for us. Absolutely astounding! Not driving ourselves allowed my husband to enjoy the scenery. Tour company went above and beyond in getting our delayed luggage out to us from Athens! Very interesting and very well organized tour, with a very knowledgeable guide, and excellent driver! I will definitely recommand this tour!